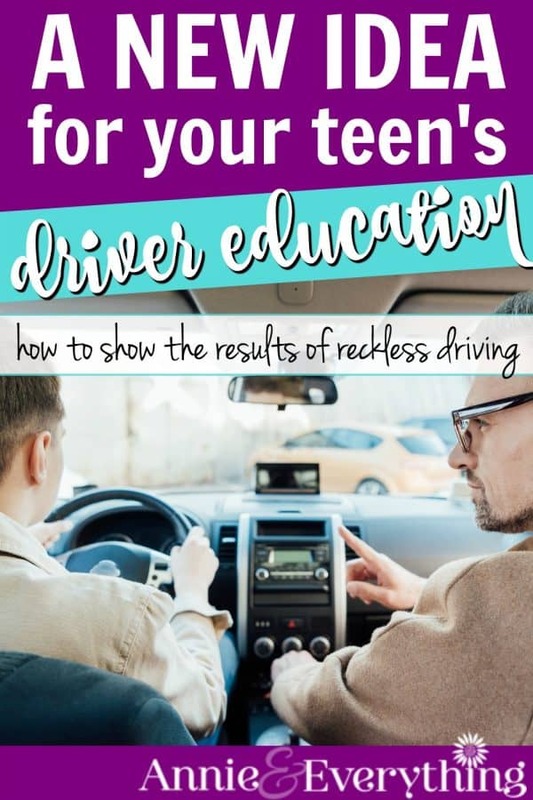 Overview: Your teen’s driver education is lacking if you have not brought home to them the dangers of driving recklessly. Here’s an activity that will do just that. It may even save their life! 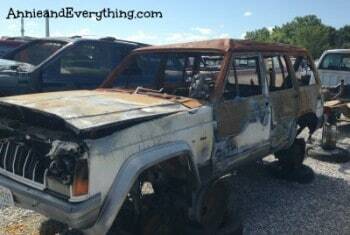 Last week I published a post about saving money on auto care by going to the junkyard. There is another great use for your local junkyard that you may not have thought of: making it a part of your teen’s driver education course. We all remember that lovely [sarcasm] film we had to watch in Driver’s Ed in school. The one that showed graphic footage from various car crashes. Blood, guts, dismemberment, etc. – it was basically a horror flick – and the most horrific part of all was that the footage was from real life. The whole point of such a film is to get teens to think about the consequences of their actions. To realize that cars can kill. To decide to be wise behind the wheel, not drive too fast, not drink or do drugs and drive – and these days, to not text and drive. But it is just a film, and as such it can seem somewhat disconnected from real life. Teens nowadays are well-versed in film editing and CG, so they may not even be that affected by what they see. Also, the memory of a movie can fade over time. What doesn’t fade as quickly is stuff that is viewed first-hand. This is where the junkyard comes in. At the junkyard teens can see, with their own eyes, the results of some pretty bad accidents, yet without the guts and gore. 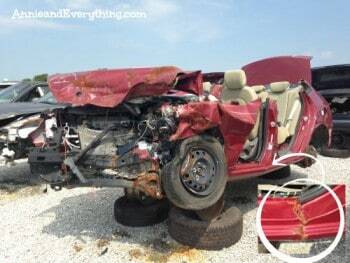 It can be quite beneficial to take a stroll through the aisles of wrecked cars… and let your teen’s imagination supply the details. (That might be a “muahahaha” you are hearing in your head right about now…) Trust me when I tell you that these mangled vehicles can pack a pretty major punch. As you walk and look, you can discuss with your wanna-be driver about the types of behavior that might have led up to what you see in front of you. You can make an albeit gruesome “game” out of trying to decide if the passengers lived or died. You can hash out some if/then scenarios, helping the teen understand how to avoid sticky situations when they are either behind the wheel or a passenger when a friend is driving. You can also go over what they need to do in the event that they are involved in an accident. Below are some examples from our latest junkyard expedition. Let me remind you that these pictures, as awful as they look, carry much less of the impact that seeing the car in person would. 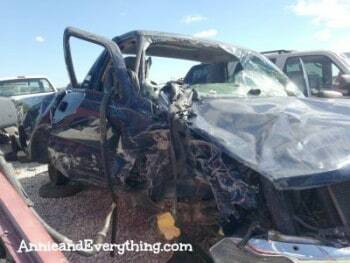 It’s important to be able to view the interior of the car, as well, to see how the passenger compartment was affected by what happened on the outside. So feel free to use them as part of your teen’s education – but don’t neglect making a trip to your own junkyard as a follow-up. This one obviously sideswiped something. I’m not liking the way that passenger door looks — if someone inside wasn’t wearing their seat belt, they may very well have been ejected from the vehicle. How would something like this happen? Perhaps by swerving off the highway? This is the end result of a vehicle fire. But it was not from a battery-jumping procedure gone south, because the engine compartment is not as badly burned as the passenger area. The car doesn’t look very banged up, except for possibly the roof — I wonder how the fire started… and if the passengers had time to get out. This one is really sobering to look at in person. It was hard to get a good angle to show what happened, but can you see how the hood is u-shaped in the middle? The entire engine compartment and front bumper have matching indentations. The engine itself is smashed practically flat against the firewall. 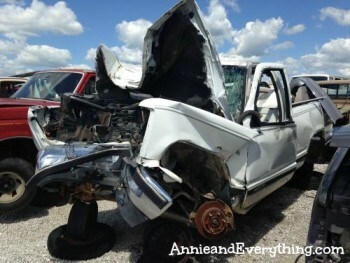 It’s fairly obvious that this truck ran head-on into a pole or tree at a very high rate of speed. As you look along the side of it, you can see how the entire truck was impacted. I don’t like to think about what must have been the result to the human bodies inside. 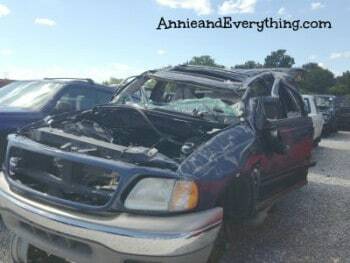 You can see from looking at these pictures that going to the junkyard can provide a necessary, if difficult to stomach, lesson for your teen driver. For any driver, really — it still gives me pause to see things like this. For homeschoolers, the time at the junkyard could be used as fodder for an assignment — a slide show with commentary, a study in observing detail or determining cause and effect, or a paper or journal entry. At the very least, this activity provides an opportunity for any parent to have a meaningful conversation about life, death, responsibility, maturity — the list goes on — with their teen. And we know those opportunities can be few and far between. Let’s not waste this one. Shared on the Hip Homeschool Hop.